The publication of the Anglo-Irish National Hunt classifications on 21 May confirmed Bobs Worth, Sprinter Sacre, Big Buck’s, Hurricane Fly, The New One and Simonsig as the top horses across the seven categories. There were no major surprises, and with the exception of top novice chaser Simonsig, all the winners were rated four pounds or more ahead of their nearest rival. In the 2-mile hurdle division, Hurricane Fly gained a mark of 175 after he became the first horse since Comedy Of Errors in 1975 to regain the Champion Hurdle at Cheltenham. It’s the third year in a row Hurricane Fly has topped this division, and his improved rating, up five pounds from last year, means he now stands second to Istabraq (176) in the all time rankings. Although Big Buck’s ran only once last season, his win in the Long Distance Hurdle at Newbury last December was enough to maintain his dominance of the staying hurdle division, which he has now led for the past five years. Big Buck’s may have only lent his World Hurdle crown to Solwhit, and on the ratings he need not worry about grabbing it back; Solwhit is rated eight pounds lower, one pound behind Quevega and Zarkandar. The novices The New One (hurdlers) and Simonsig (chasers) have their big times ahead of them, and in the weeks to come I’ll look back on their season along with those of the other winners. That leaves us with the chase categories. There was a vacancy at the head of the staying chase (3m+) division following the retirement of Kauto Star. Bobs Worth progressed from top novice of 2012 to win the Gold Cup and record a mark of 180. The star of the chasing season was Sprinter Sacre, and he led the field in both the 2m and 2m 4f divisions. A mark of 188 is the highest ever awarded in the each category, and only 2lbs below the 190 that Kauto Star achieved three years ago. 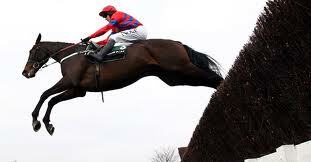 As Sprinter Sacre is just a seven year old, you can only wonder at what heights he might attain in the next few years. I don’t agree. I think he’s a great horse already. Do you? Can he beat Kauto Star's rating in the next year or two? https://www.geegeez.co.uk/wp-content/uploads/2018/09/geegeez_banner_new_300x100.png 0 0 IanS https://www.geegeez.co.uk/wp-content/uploads/2018/09/geegeez_banner_new_300x100.png IanS2013-05-23 13:55:552013-05-23 13:58:35Sprinter Sacre - ready to better Kauto?